Park 360 is a column only available at adventureparkinsider.com. 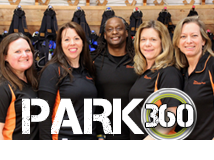 Each month we will profile a park or zip line exploring what makes them successful whether it’s their creativity of course design, innovative training program, excellent safety practices or successful business strategies. The best ideas often come from your colleagues in the industry. Insider Marketing is a new column available only online at adventureparkinsider.com. Each month we will tackle marketing topics that will help you attract customers and set your zip line or adventure park apart from your competitors. Ask the Experts is a column available only online at AdventureParkInsider.com. We’ve heard the call for expert advice and in response have gathered a panel of experts to answer your burning questions! Each month we will answer a reader submitted question about adventure park operations. Have a question you want answered? Submit it here: adventureparkisider.com/ask-the-experts.